Replacement part for product #149. Sold individually. 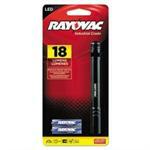 Replacement Tip for Rayovac LED Earlight (product #149). Sold individually. Replacement Tip for Advanced Slimline Earlight (product #149). Sold individually. Just snap on to the disposable Oto-Probe for a magnified view of ear canal, and eardrum.